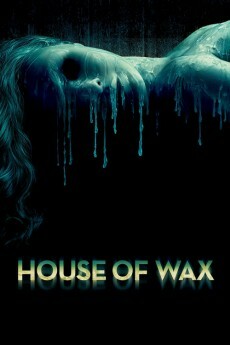 House of Wax was one of the few films made in 3D which was a huge success. This may have more to do with the fact that it had a good, strong story and great acting and did not rely solely upon it's 3D special effects. 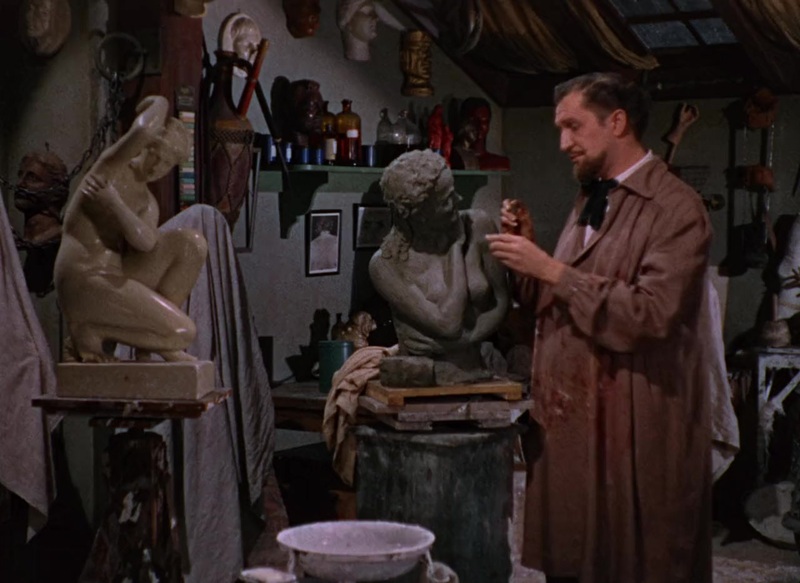 The late great Vincent Price is Henry Jarrod, a sweet and dedicated artist who creates lifelike mannequins for a wax museum. His statues - depicting everyone from Marie Antoinette & Joan of Arc to John Wilkes Booth - are loved by Henry as much as if they were his own children. When he objects to creating more horrific sculptures to attract more paying customers, his partner sets the museum on fire, hoping to collect a tidy sum in insurance money. 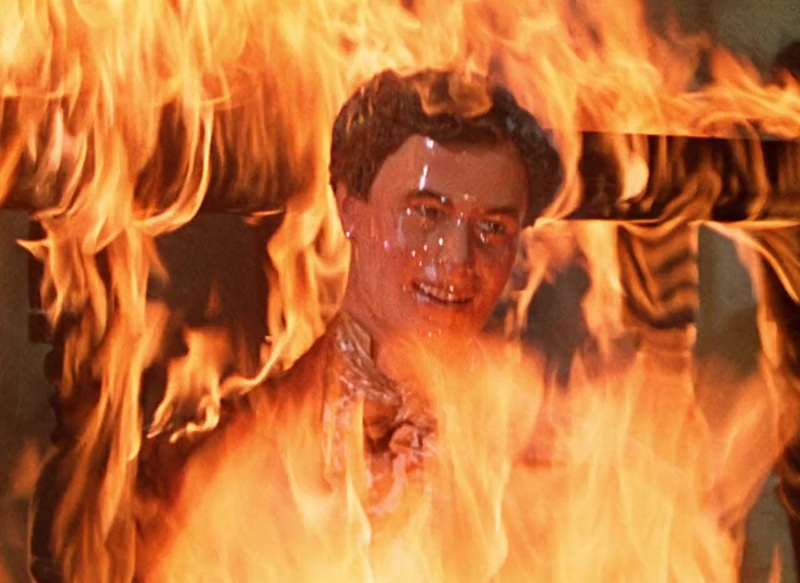 Henry supposedly perishes in the flames, trying in vain to rescue his beloved wax friends in a scene which is truly heartbreaking. Some time later, Henry reappears, wheelchair bound and just a tad bitter. He has opened a new wax museum which features realistic scenes of murder and horror, many of them taken from current headlines. Unfortunately, some of them are just a little TOO realistic: one looks like Henry's ex-partner, who was found hanging in an elevator shaft. Was it really a suicide, or something more sinister? Joan of Arc bears a striking resemblance to Cathy Gray, a young girl who has gone missing from her room. And Cathy's friend Sue looks exactly like the lost Marie Antoinette, the pride and joy of Henry's former exhibit. Soon, a horribly scarred monster is chasing Sue through the foggy night time streets. Can the police, and Sue's artistic young suitor, solve the mystery in time? Or will Sue wind up as yet another display in the House of Wax? 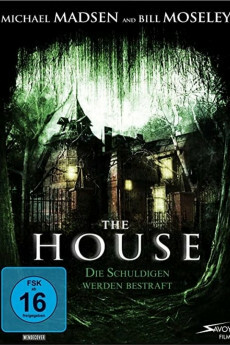 This is a wonderful, creepy scare-fest with great sets, beautiful colors and strong performances. Vincent Price as Henry Jarrod is both lovable and horrifying as the kind man driven mad. Charles Bronson, in a very early role, is super freaky as Henry's mute and morbid assistant. Carolyn Jones (in her pre-Morticia Addams days) is blond, pretty Cathy, the squeaky opportunist with the heart of gold. Phyllis Kirk is the sensible Sue, a slightly uptight but genuinely believable victim. The scene where she must run through the deserted, fog-soaked streets is very, convincingly creepy. When Sue actually stops long enough to remove her noisy and cumbersome high heeled shoes, which give away her every step on the cobblestone road, I very nearly applauded. The 3D effects are an added bonus to an already wonderfully fun movie - watch for the classic paddle ball scene! This is one of Price's best starring role films. 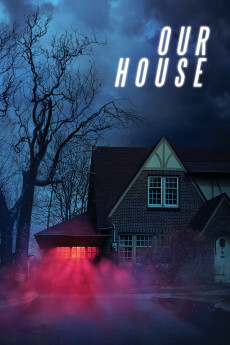 It is everything that a good horror film should be - funny without being ridiculous, scary without the gore and fantastical without being far fetched. 10 stars!!! Don't miss it! "Professor" Henry Jarrod (Vincent Price) is a sculptor who works in wax. He's living in New York City in the late 19th Century, and he's displaying his handiwork in a wax museum. When his partner, Matthew Burke (Roy Robert)--really his primary investor--balks at Jarrod's receipts and tries to talk him into moving in a more commercial direction, perhaps with a "Chamber of Horrors", Jarrod protests that he's creating meticulous works of art, not cheap sensationalism. Jarrod tries to interest a new investor, but when the prospect says he can't make a decision for a few months, Burke says he can't wait. He suggests torching the place and collecting the insurance money. When Jarrod refuses, Burke torches the museum anyway, and the two fight. Jarrod supposedly dies in the fire, leaving Burke to collect. However, when a mysterious, disfigured stranger shows up, the resolution may not be so simple. The debate that Jarrod and Burke have in the opening scene of this remake of Mystery of the Wax Museum (1933) is particularly ironic in light of the film's history. House of Wax was made as a 3D film--a fact made more than obvious from the film's opening credits, which are presented in a font made to look like it is bursting forth from the screen. In the early 1950s, movie theater box office receipts were down because of television. Film studios and movie theaters were looking for gimmicks that would make films seem more special. They were looking to do things that television couldn't do. According to film editor Rudi Fehr, "The House of Wax was made because the theaters were empty, people were staying home to watch television. In order to lure the audiences back to the theaters, Warner's came out with 3D." While this wasn't the first commercial 3D film--1952's Bwana Devil holds that honor, this was certainly one of the more popular ones. Studio head Jack Warner told Fehr that he would have five weeks to edit the film after shooting was done. Fehr said they could get it done even quicker if director Andre De Toth would shoot the film in sequence. So Warner demanded just that, despite De Toth's protests. Shooting in sequence is unusual and can make the on-set crew's job much more difficult. But it certainly didn't negatively affect the performances or De Toth's direction, which are both outstanding despite a couple strangely truncated bits of exposition. Like many 3D films, there are a few shots in House of Wax that might otherwise be inexplicable. The most prominent example here is a huckster who stands in front of the revamped House of Wax doing tricks with three paddleballs. We linger on him much longer than we normally would so that he can bounce the ball into our face. This shows part of the difficulty of 3D--it's difficult to reconcile the most impressive effects from the audience's perspective with narrative needs. 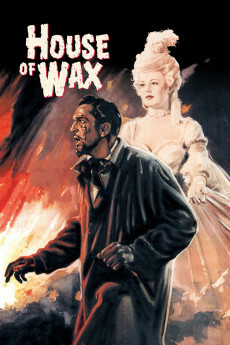 Viewed now, in simple 2D on a television screen, the obligatory 3D shots of House of Wax play as quirky, campy curios. For me, that adds to the charm of the film. Price has an unusual role here in that he plays a good portion of the film with disfigurement makeup, half-limping, hunched over, covered in bulky black cloaks in a manner that somewhat prefigures John Hurt's turn as John Merrick in The Elephant Man (1980). De Toth is excellent at building atmosphere, especially in the "external" shots, which frequently feel more like we're watching a version of the Jack the Ripper story set in London. Most of the script by Crane Wilbur, based on a play by Charles Belden (which also served as the basis for 1933's Mystery of the Wax Museum, of course), is deliciously flagitious--degenerate in a more over the top manner than was usual for the period. The conflagration at the end of the opening is particularly unexpected and twisted, as is Jarrod's modus operandi throughout the film. It's only too bad that the self-enforced Hollywood "moral code" at the time could not have allowed for a more nihilistic ending. I for one was cheering on Jarrod and his assistant Igor, played by none other than Charles Bronson in one of his earlier roles, when he was still using "Charles Buchinsky". Although it's difficult to say whether Belden, Wilbur or De Toth intended a message or subtext, it's easy to read a number of interesting angles into the film. To begin, the use of the name "Igor" for the assistant suggests a number of twisted turnabouts on Dr. Frankenstein. Jarrod is even more depraved than the good doctor as he "creates death" out of life, in the service of art. At least it seems depraved if you're not an artist. If you are, you might simply note that one must suffer to be beautiful. That's more than just a flippant remark, as Jarrod suffers financially for beauty early in the film, and Cathy Gray (Carolyn Jones) suffers physically for beauty as she nearly suffocates herself to make herself thin. And of course there's the literal, sinister sense in which the artist makes others suffer to create his beauty. There are also very interesting subtexts available related to goals of realism in art, and of course, the ironic messages noted earlier in the beginning of the film, where we are debating aesthetics versus financial, or more material considerations. 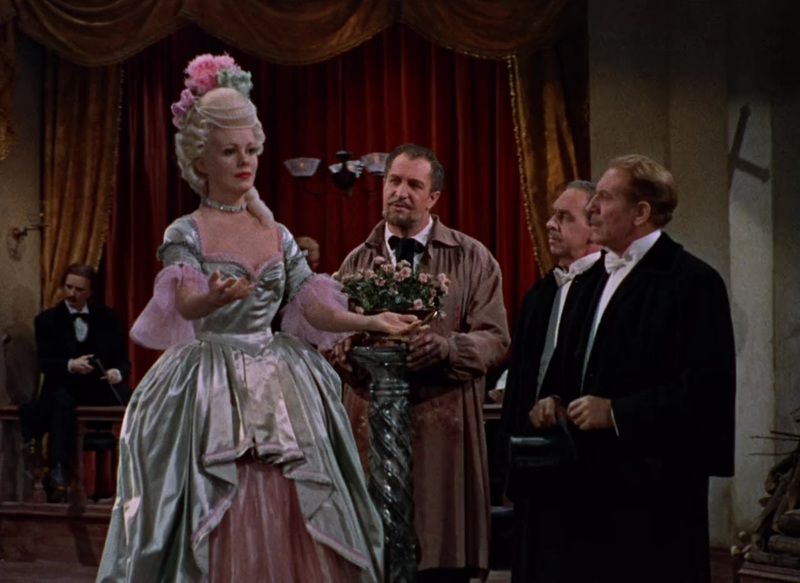 Although House of Wax was popular at the box office in 1953, there was no shortage of critical devaluations of the film as a cheap gimmick, and no shortage of complaints about image quality and eyestrain when trying to view the film in 3D. 3D was only prominent for another year or so (to make periodic returns later, often for "number 3" films in series), but House of Wax is a much better film than it was given credit for at the time. It's not Vincent Price's best, but it's well worth viewing. The House of Wax is a true horror classic! The House of Wax is a true horror classic! I saw it for the first time in 1953 at a local theatre in 3-D. I have seen it many times since on video. It never ceases to entertain. While watching it today I noticed something for the very first time: a most interesting anachronism. This film takes place in old New York circa 1900. Every indoor scene has a gaslight in it, and the fire department responds with a horse-drawn wagon. Well, in one of the early scenes in the film Prof. Jarrod(Vincent Price)is conducting a prospective investor, Sidney Wallace(Paul Cavanagh), on a tour of his wax museum. There are gas lights everywhere. They arrive at an exhibit and Prof. Jarrod flips a wall switch, and presto the exhibit is illuminated in light. Somebody goofed! If you've never seen The House of Wax, watch it. You'll love it. One more interesting note. Dabbs Greer who plays Sergeant Jim Shane in this film also plays old Paul Edgecomb in the 1999 thriller The Green Mile.